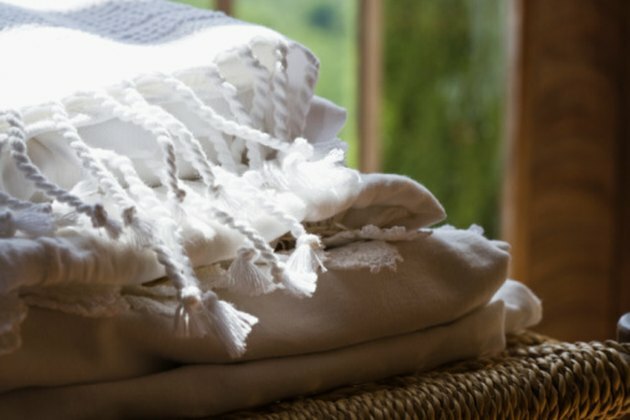 Damp or forgotten blankets can easily grow mold. Occasionally, running the blanket through the washing machine immediately after you discover the mold is enough to remove the marks, but often the stain is discovered after some time has elapsed. Sunlight and fresh air help to kill mold spores, but often you need stronger means to completely remove mold from blankets. Store blankets after drying them properly to prevent mold growth. Take your mold-stained blanket outside. Mold spores spread easily and multiply quickly, so you want to keep as many of them out of your home as possible. Brush away as much of the dried surface mold as possible with a stiff-bristled brush. Spread the blanket in the sun for several hours. If the mold stains are fresh, this may be enough to kill the mold and allow you to brush away any remaining stain. Older or large stains will require more care. Mix 3 parts baking soda and 2 parts white vinegar into a paste. Rub the baking soda paste into the mold stain and allow the blanket to sit for at least 30 minutes. Wash the blanket according to its label instructions. Do not place the blanket in the dryer. Instead, take it outside and examine it carefully to see if any mold stains remain. If stains are still present, apply a paste of lemon juice and salt to the stains. Allow the blanket to dry in a sunny location before examining it again to see if the mold is removed. Rinse the blanket in your washing machine and allow the blanket to dry completely outside in the sun.